It is T20 season, and the IPL juggernaut starts moving practically the day after the World Championship gets over and ends on May 29. In the mean time the break in Tests ends with the start of the England-Sri Lanka series in mid-May. This gap makes it a good time to update some Test statistics, since we are now confident that they won’t need to be updated for a few weeks. There are also columns for percentages of wins, losses and draws as well as the win-loss ratio, for those who would like to play around further. I am now giving a few more spreadsheets for some other indices of performance. Hereafter we are considering all Test captains, even if they have captained in only one Test. The first 50 positions are for those who have either zero wins or zero losses. The highest win-loss ratio is 9.0 for Jardine, followed by Bradman, Steve Waugh, Brearley and Chapman. Imran Khan (junior), a Pathan like his better-known namesake, already has a couple of interesting Test records in his name. One, he joins the select group of only 5 players with 5 or more Tests whose team won every Test he played in. Here are the other 4. Of these, GJ Bailey is a current player but is not very likely to play for Australia again. If one really looks into it, Baptiste and the others were not particularly distinguished players but happened to be in the right place at the right time. Perhaps Imran has contributed more to his side’s wins than the others. For instance, he has 14 wickets including a fiver in his 5 Tests. Baptiste has one fifty and 16 wickets (best a three-for) in 10 Tests. The other three are specialist batsmen with no fifties. During his 5th Test he finally got a chance to face a ball in what was only his 2nd innings. He faced 8 balls in 24 minutes and was dismissed for zero. The only other time he batted was on his debut, when he spent one minute at the crease and did not face a ball. Gary Sobers was the first to score a maiden Test century which was a triple. Only two other batsmen (KK Nair being the latest addition) have done this. Although the circumstances here were not so dramatic, Bob Simpson’s Test career was more conventional but there was a twist in the end. He did well enough to keep getting selected and tended towards opening the batting. He also had occasional useful spells as a change bowler. In due course he captained Australia, starting with the 2nd Test against South Africa in 1963-64. Everything went well except for the lack of centuries. After Australia regained the Ashes in 1958-59, the next few series were defensive stalemates with 1-1 victories in 1961, 1962-63 and so on until Snow’s bowling finally got back the Ashes in 1970-71. No less than 14 fifties with a top score of 92 (twice). He had not done particularly well in the first three Tests of the series, and had not even claimed the occasional wicket. Thus dawned Simpson’s 30th Test at Old Trafford, Manchester on 23 Jul 1964. This was not considered to be a batsman’s wicket and perhaps the wounds of Laker’s 19-90 in 1956 were still raw. On this occasion England’s bowling lineup was not particularly good, including the soon-to-be forgotten Fred Rumsey opening with an equally undistinguished John Price (who played long enough to trouble Gavaskar in 1971). The only bowler who stood the test of time was Fred Titmus, while part-timers like Dexter and Boycott also bowled in this match. Simpson and Lawry opened and both got centuries (Lawry 106) in an opening stand of 201. At close on the first day (23 Jul) Australia had made 253/2 with Simpson on his maiden century with 109* and O’Neill on 10*. Unlike in Sobers’s record-breaking innings which we saw earlier, nothing obviously went wrong with England’s bowling. It simply wasn’t good enough. At the end of the second day (24 Jul) Australia was 570/4 with Simpson crossing the second hurdle with 265* and Booth on 82 not out. On the 3rd day Simpson’s marathon innings ended on 311, dismissed by the hard-working Price who ended with 3-183. Australia finally declared at 656/8 and England made a strong reply with 162/2 with captain Dexter (71*) and Barrington (20*) at the crease at the end of 25 Jul. After the rest day, the rest of the match was somewhat of an anticlimax with England grinding out 611 (Dexter 174, Barrington 256) after finishing the 4th day with 411/3 (Barrington 153*, Parfitt 12*). McKenzie did take 7 wickets but did not seem to have much support. Veivers with 3 wickets was the only other successful bowler. “When Test cricket was decimated by the breakaway World Series Cricket in 1977, Simpson made a comeback after a decade in retirement to captain New South Wales and Australia at the age of 41. All of Australia’s first-choice players had defected apart from Jeff Thomson. Simpson had been playing for Western Suburbs in Sydney Grade Cricket but had not been playing at first-class level for a decade. 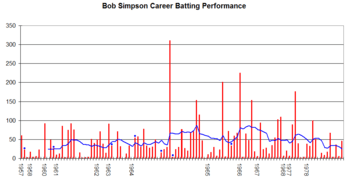 Bob Simpson’s career performance graph. His first assignment was a five Test series against India, and Simpson began where he left off a decade earlier. He top-scored with 89 in the second innings of the First Test in Brisbane, before scoring 176 and 39 as Australia won in Perth. Simpson failed to pass double figures in the Third Test in Melbourne, and made 30s in both innings in Sydney, as the Indians won two consecutive Tests to level the series. Simpson responded with 100 and 51 in the deciding Fifth Test in Adelaide as Australia scraped to a 3–2 series victory. Simpson totaled 539 runs at 53.90 and took four wickets. It would be fair to say that he played a major role in India’s 3-2 loss though he was out of his depth against the West Indies, even though the last 3 Tests were played against a weak de-Packerized squad. Thus end the stories of Gary Sobers and Bob Simpson, the first two Test players whose maiden centuries were triples. The third member of this exclusive club was KK Nair in 2016. A weird coincidence: Although they were quite different types of players who peaked at different times, they were both born in 1936: Sobers on Jul 28 and Simpson on Feb 3.